Acclimation of Industrial Floor Coatings requires conditioning of the flooring material at or near occupancy level. The manufacturers of most laminate floors require the cartons of flooring to be acclimatized for 48 to 72 hours prior to installation. Check the installation instructions to see how they want the material stacked for installation and if the cartons are to be opened or left unopened. Not all manufactures require onsite acclimation. 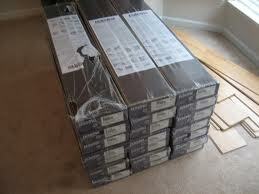 The flooring material needs to be acclimated in the area of installation. This means that if the laminate is to be installed in the family room, acclimation of the laminate flooring should take place in the family room. Storing the laminate flooring in the garage is not acclimation even if the garage is attached. Storage of the material at the store or warehouse of the dealer or installer is not acclimation of laminate flooring unless the floor is to be installed in the store or warehouse. Not all laminate manufacturers require acclimation. If the dealer or installer says it is not necessary to acclimate insist that they show you where the manufacturer states that in writing. Don’t make the manufacturers, dealers or installers problem yours. If they say that the floor does not require acclimation insist on getting this in writing. When a floor acclimates the product is adjusting to the humidity of the area of installation. All wet work in the area of installation such as plastering and painting must be completed prior to the start of acclimation. All windows and doors must be installed prior to the start of acclimation. The heating and air conditioning system must be operational at or near occupancy levels and meet the price chart for cost efficiency. If installing over concrete the concrete should have been tested and found to be at acceptable levels for the installation of the laminate. When a floor is not acclimated prior to installation it can be hard to click together chipping or damaging the edges of the laminate. A floor that is not acclimated to its environment is more likely to experience problems such as expansion, tenting, squeaking and buckling after installation. When you are not sure if your laminate flooring needs to be acclimatized, play it safe and take a couple extra days for acclimation of laminate flooring. What brings out proud edges? Is it lack of ????? Proud edges are when one side of the flooring is thicker than the other. If the high edges developed after installation you can have high edges for other reasons such as the floor lifting from expansion or a moisture concern.